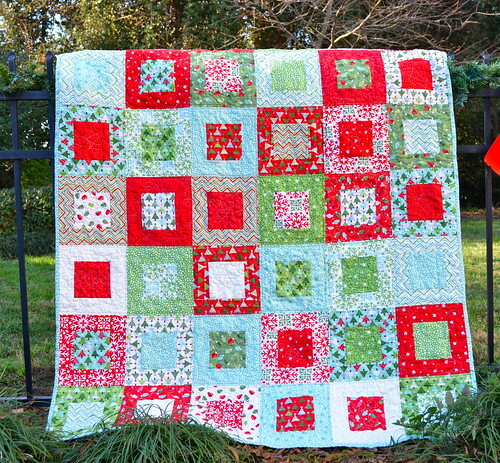 mon petit lyons: Christmas Quilt Finished! 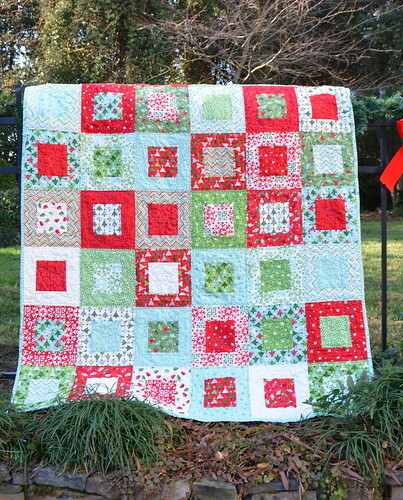 After a few nights of late night binding sewing, I finished the Joy Christmas Quilt for my parents. I purchased one charm pack and one jelly roll from Kate Spain's Joy line and I was really pleased with how far they went. I bought a couple yards of the bella solid in the aqua color for the back and a half yard of one of the prints from Joy for the binding. 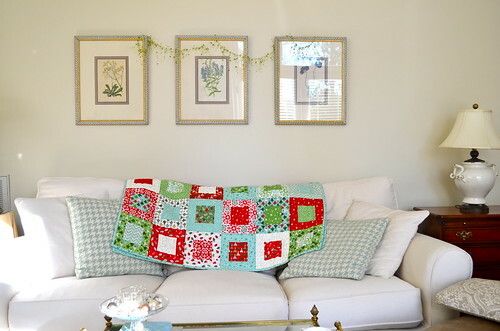 Each of the 42 squares is a charm square with a jelly roll border. In this photo you are seeing all but the very top row of squares. 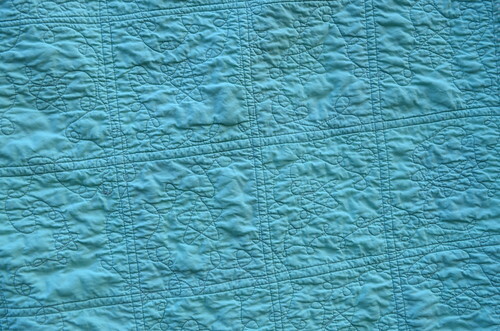 I quilted with straight lines first - 1/4" on either side of each ditch and then moved along to free motions quilting with stars and swirls. This is not my first time with stars (see my Wheels quilt), but I was at a loss for how to quilt this and was not even considering stars until Fiona suggested it, so thanks, Fiona! I didn't have quite enough of the bella solid for the back, so the extra jelly roll scraps came in handy. In fact I think I have enough bits of them left to make a pillow. We'll see if I actually can get it finished for Christmas 2012! Here it is at home. It is a little bright compared to the rest of the decor! I had to share a few pictures of my mom and dad's house, although she was still not completely decorated. 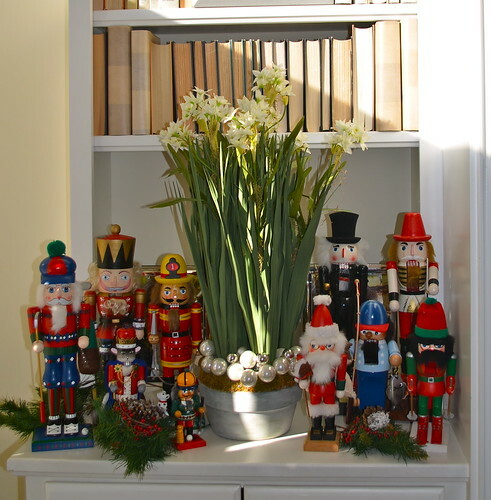 I love the small glass ornaments at the base of the paperwhites. My mom does a lot of little touches like this. 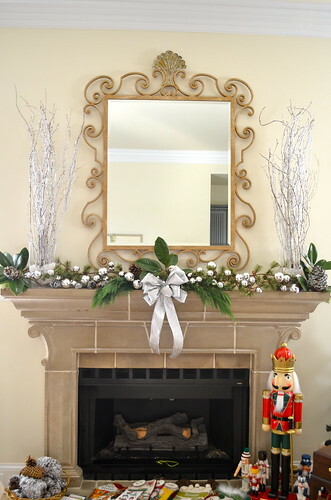 The stockings were not hung yet, but I just love those sparkly branches on the mantle (and the mantle, for that matter - I really want a cement mantle!)! Now that my big project is finished, I am starting to think I have time for some little last minute handmade gifts. Zippity pouches and things. We'll see! I still have to get those pillowcases finished for Sandy Hook and then we'll see how the next few days shake out. How about you? Are you getting everything you hoped finished in time or are you starting to reevaluate your to-do list? I hope you're enjoying the season and getting plenty of sewing time along with lots of holiday cheer! The quilt is so pretty! How big is it? My handmade list wasn't so long, so I'm going to be able to finish. Merry Christmas! 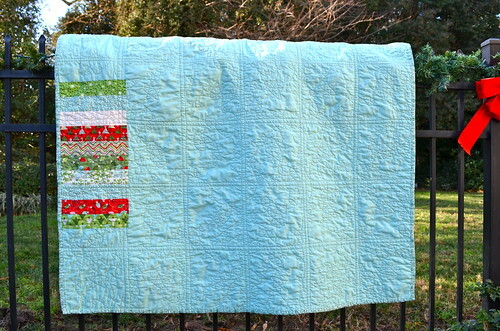 What a gorgeous quilt and so fun to make with the charm pack and jelly roll. AND your quilting looks good! Your Mum's house is beautiful too! Courtney, it is really pretty & festive! I also was wondering how big it is, Merry Christmas! Oh they will love their quilt! What a lovely gift! And sometimes the simplest patterns produce the most beautiful gifts! So pretty! Great choice in fabric. Love it! It brings a lovely pop of colour to the room.